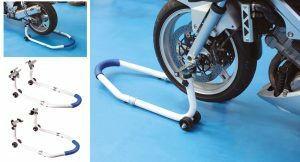 New from Laser Tools is this combination motorcycle stand for front or rear wheels (part number 6495). Two handles are supplied — convert from front to rear stand by simply changing the handle and the support adaptors. Fully adjustable to fit most motorcycles. The height is also adjustable and the stand has a load capacity of 200kg. The four wheels and strong 1.8mm tubular steel construction give excellent stability. 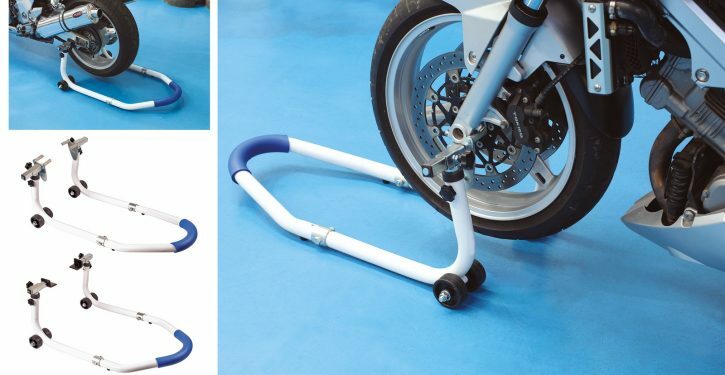 Mounting the motorcycle on the stand is a two-man operation — your assistant supports the weight of the motorcycle in the upright position as you adjust and then fit the stand — then very easily lay the handle down flat and the wheel is lifted. Full assembly instructions are included. Part of the ever-increasing range of motorcycle tools from Laser — this terrific time saver is available now at a typical price of £102.41 (inc. VAT). 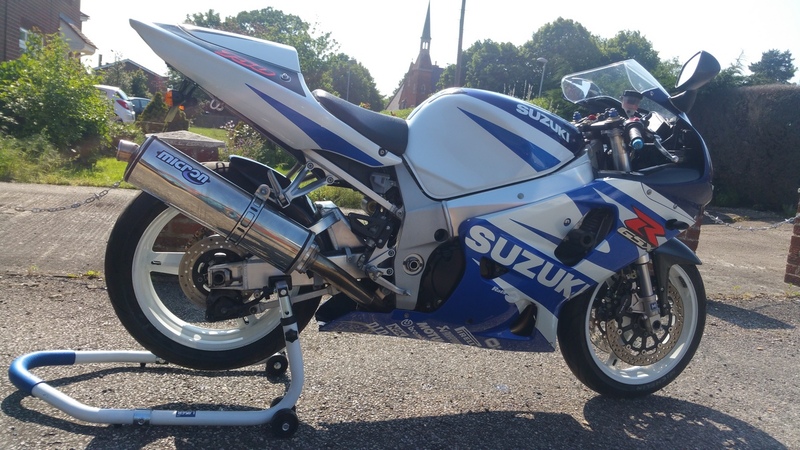 Requires assembly but takes less than 10 minutes and comes with three fitments, two for the rear (swingarm and bobbin (available separately) mounts) and front fork fittings. Each fitment is interchangeable in minutes. The original advert stated that two persons are required to use but we managed the rear stand with just one (see pic far left). 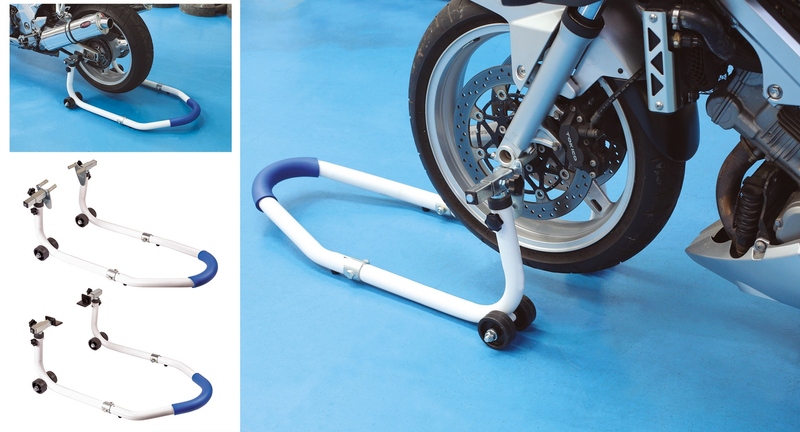 It’s the first motorcycle stand we have seen that you can use for the front and rear so saves space in the garage. Build quality is very good and the bike remains sturdy, the fork, bobbin and swingarm fittings are all adjustable so you only need to set up once. Two handles are also supplied, a wide one for the rear stand and a narrow one for the front. Makes simple maintenance and washing an easy job.